Travelling around the French countryside, there is an indefinite number of fascinating restaurants, farms and people to meet. Known throughout history as a Mecca for food and wine cultivation specifically for cheese and champagne, it isn’t hard to find local recommendations of places to visit from excited and proud village people. On a recent trip to France travelling around the Alps from our Air bnb in the small village of Antonaves, I was lucky enough to learn about L’araignée Gourmande or the hairy spider, in the town of Laragne. Looking more like a bank than a near Michelin star restaurant, in the back streets of the centre square, inconspicuous and somewhat boring I was hoping to find a bustling metropolis behind the otherwise clinical doors. Instead, I found an empty restaurant filled with late 80’s décor – think American Psycho – and an eager hostess who was both elegant and as dated as her furniture. Putting my best French forward, Je dois une réservation pour deux s’il vous plait we were taken to our table and asked if we’d like to start with the daily palate cleanser. After light mouthfuls carrot mousse amuse broche and a glass of champagne we ordered with a combination of curiosity and slight confusion due to my inability to translate the menu. Naturally opting for both the chef’s choice three courses, hoping to try a little of everything on the menu. 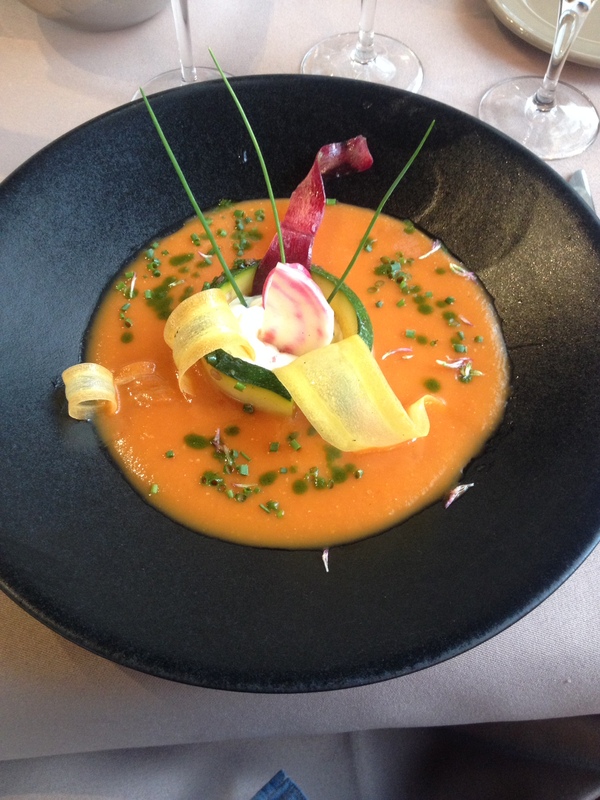 The floating island of cold tomato soup with zucchini, cottage cheese and herbs was a light, cold and surprisingly filling, refreshing start to the menu. Gazpacho comes in all different forms; chunky, thick, thin, heavy and light but this deep bowl full was thick, smooth and pureed to perfection. Mixing in the cottage cheese centre, the light orange colour because almost pink and removed any wateriness the tomato may have left behind. 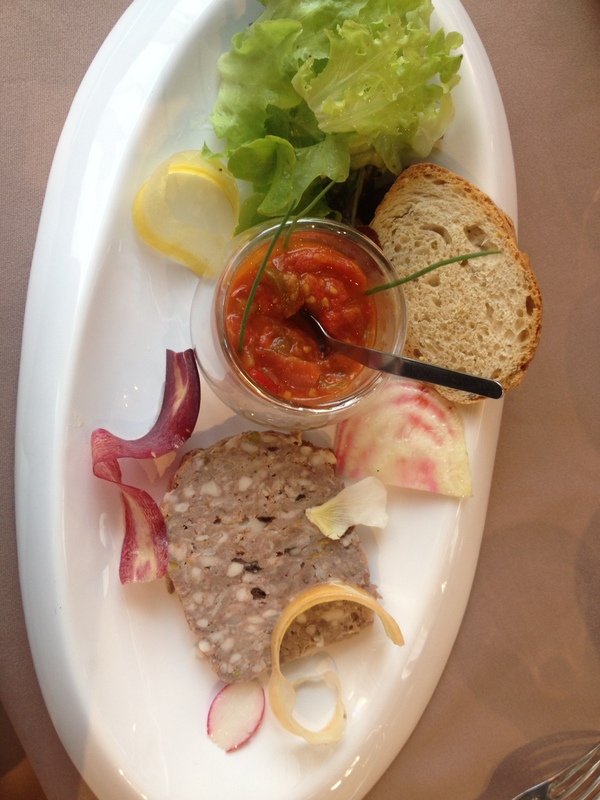 Not the prettiest of dishes but this tasty terrine served with a chunky gazpacho-style chutney over slices of fresh bread has the balance of fatty, rich meats and clean, fresh onion and tomato. I had to hold back from eating the chutney with a spoon which I probably would have done so, had it not matched so well with the terrine. Poitrine de volaille farçie à la crevette, Rizotto aux herbes, Jus à la sariette. 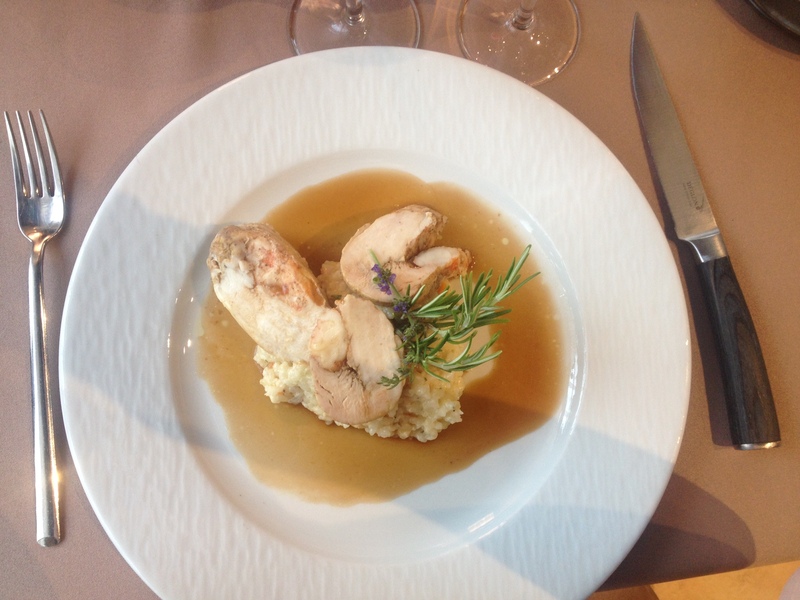 The chicken breast stuffed with crevette and served with risotto and a natural chicken jus is a great summer meal. The light flavours of the risotto blend well with the white chicken meat and the hint of fresh rosemary cut through the thick and salty jus as it absorbed into the fluffy rice. Filet de canette en croûte de noix, pomme purée, jus à la tapenade. 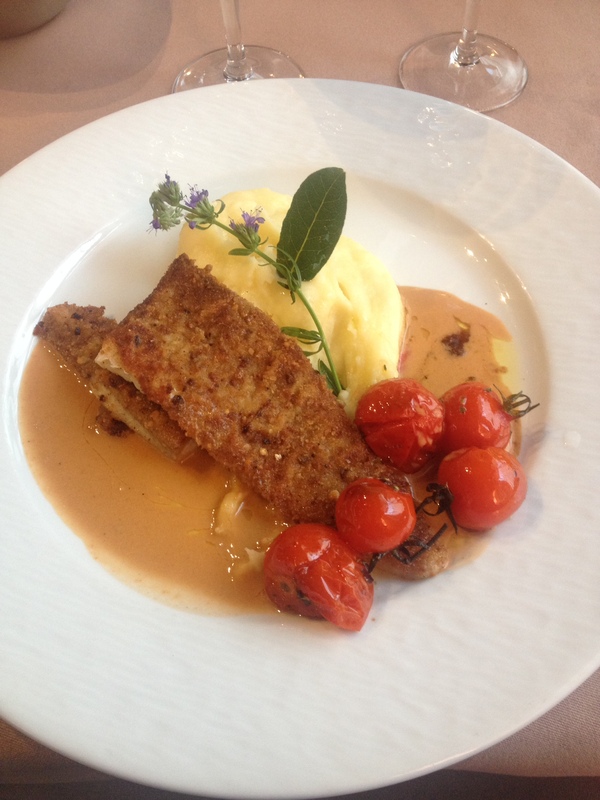 The duckling fillet crusted with potato purée and a tapenade jus. There is nothing worse than lumpy, dry mash potato and accompanied with fatty duck, fortunately there was not a single lump or shred of fat to be seen. The air whipped purée hardly required any chewing on my part and matched with the lean, tender and crisp crusted fillet of duck and a drizzle of roasted tomato over top, each mouthful was pure satisfaction. Crème brûlée classique à la vanille. The classic vanilla crème brûlée, expected on every French menu, can often be the worst dish in any restaurant. Often butchered, this brûlée was heavenly with the exact crystallised, sugary top and the sweet, soft eggy creaminess inside. 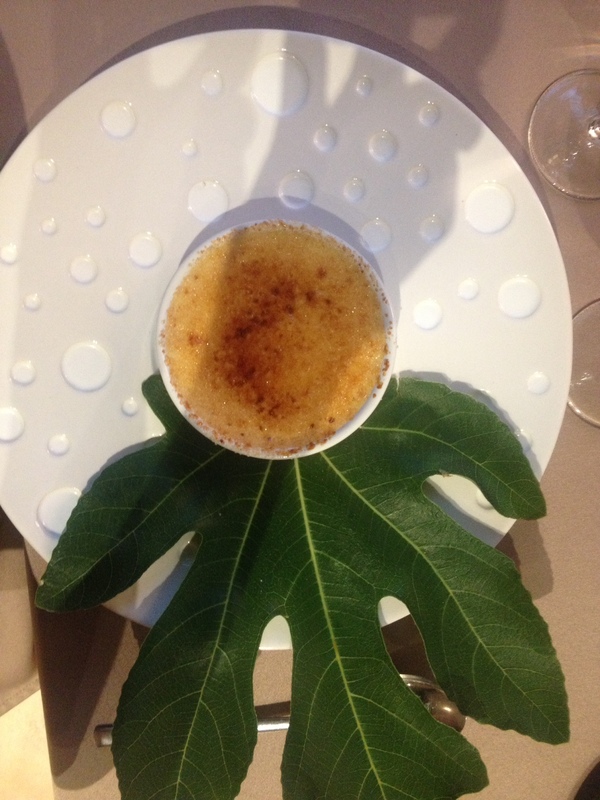 A small dish, served on an impossibly large plate – with a side of tree – crème brûlée is the best way to finish any rich, French meal. Ballotin d’abricot et crème d’amande rôti au four Ballotin. This desert is everything you could want or expect from a French desert. Apricot almond cream pastry puffs, roasted in the oven that simply melt in your mouth. 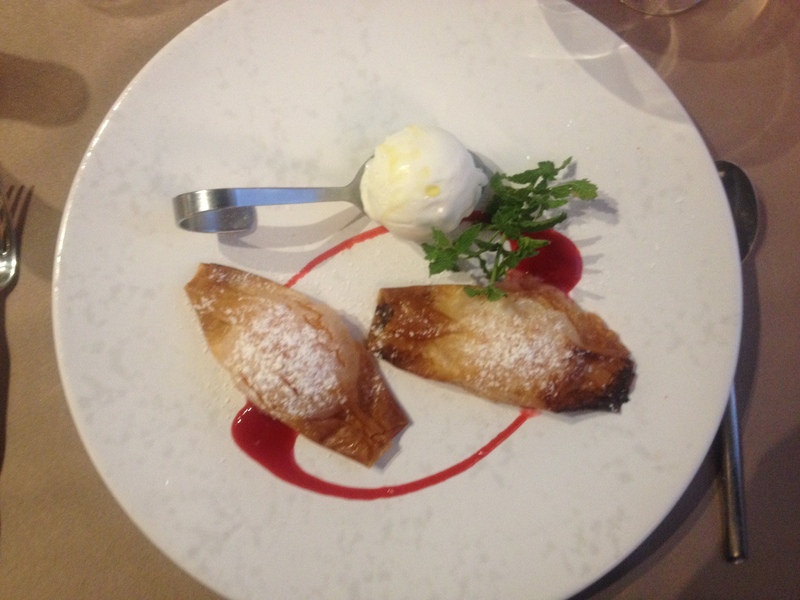 The perfectly crisp, hot pastry encases the apricot that is just warm enough to melt the ice-cream with each scoop. The creamy centre of the almond cream with the sweetness of the apricot proves for a well balanced desert that is just enough after such a big meal. All of this for just € 18 per person. ← Perfect winter snacks in Berlin.